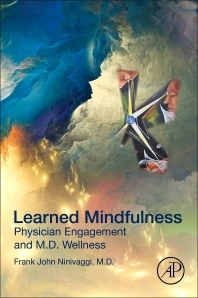 Learned Mindfulness: Physician Engagement and M.D. Wellness discusses the original technique of "Learned Mindfulness" developed by Dr. Ninivaggi to combat stress and burnout. In this book, Dr. Ninivaggi uses his Integrity Mindfulness model as a tool to manage stress, prevent burnout, and broaden quality of life, ultimately promoting well-being. Helping physicians ultimately helps patients and extends to the public enhancement of greater equanimity. The book provides readers with background information on the origins of mindfulness and details step-by-step directions on how to use the original technique. Frank John Ninivaggi, M.D., is an associate attending physician, Yale–New Haven Hospital, assistant clinical professor of child psychiatry Yale University School of Medicine’s Child Study Center, and psychiatric director of the Devereux-Glenholme School in Washington, Connecticut.